Yes, the sun has come out in Wales. It’s extremely exciting, and the locals are baring their translucent white legs in fear that this week might be all they get of summer. Yesterday it reached 28 degrees – unheard of in this part of the world in May. Kath is almost melting in the heat, which is hilarious to an Australian. This time last week we had a maximum of 11 degrees. Barbecuing in the evening - what a treat! So we’ve been out and about. I can get around a lot better now and we’ve been to Anglesey for lunch, taken the Festiniog Steam Train to Portmadog, and taken a train ride up Snowdon, the highest peak around here. Of course we've also been in ducking into pubs to have pint in the sun, there are a lot of very cute pubs around here. I feel it's our duty to visit them all. Lawrence is trying to drink his body weight in beer whilst we are in the UK. It’s been quite a week. I’ve also starting pulling out the tatty stuff from the new home (still nameless). I’ve ripped out curtains, thrown out nasty cushions, an old pot, the ancient satellite TV equipment, the fridge!!! Well Lawrence and Pete threw out the fridge. We needed a new fridge as the old one was the smallest fridge in the world. One couldn’t fit wine AND tonic in it, let alone food. This coming Wednesday I get my walking cast and we are heading off to Scotland (driving, not walking) to visit Lawrence’s sister in Glasgow and friend Maggie in Dingwall (just north of Inverness). That’s all from us, must get outside to top up my vitamin D levels whilst I can. Here is the news (and this time it’s NOT about my ankle)… we are selling the Mog. Yes, you heard it here first, the big yellow Unimog is 4 SALE!! There are a number of reasons for selling the old girl, but briefly, we want to spend a lot more time in Europe just tootling about and the Mog is not the vehicle to do that in. It uses way too much fuel and is not much chop in hill towns and cobbled lanes. Plus there is the obvious fact that I can’t drive the thing, especially now that I have a dodgy ankle. The decision was made pre ankle breaking, in Morocco actually. 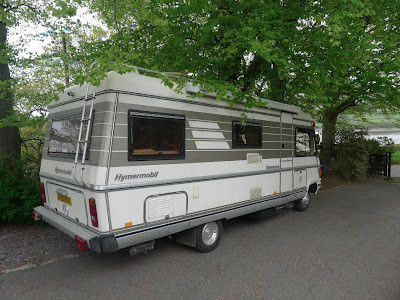 We have really taken to the whole camper-van lifestyle, and have now bought a suitable retired persons old motorhome – a 1990 Hymer, with lots of space but not too big. If we ever get out of Wales, we’ll spend about 2 years pottering around Europe, focussing on wine regions, and Eastern Europe. Driving back to Australia eventually is a whole different story, more on that later. In further news, we have won our battle with the Allianz. My wonderful surgeon wrote them a stern letter with his views on their proposed treatment and they smartly changed their minds, so we are £8,700 better off, PHEW. I now have cast number 6 on my leg and this one stays on for 2 weeks, then I get my weight-bearing cast. 2 further weeks on that I think, then I get a boot (black leather, small stiletto??) that I can walk in and hopefully ditch the crutches soon after. That’s when the physio starts. As you can see we will be hanging around here for some time. 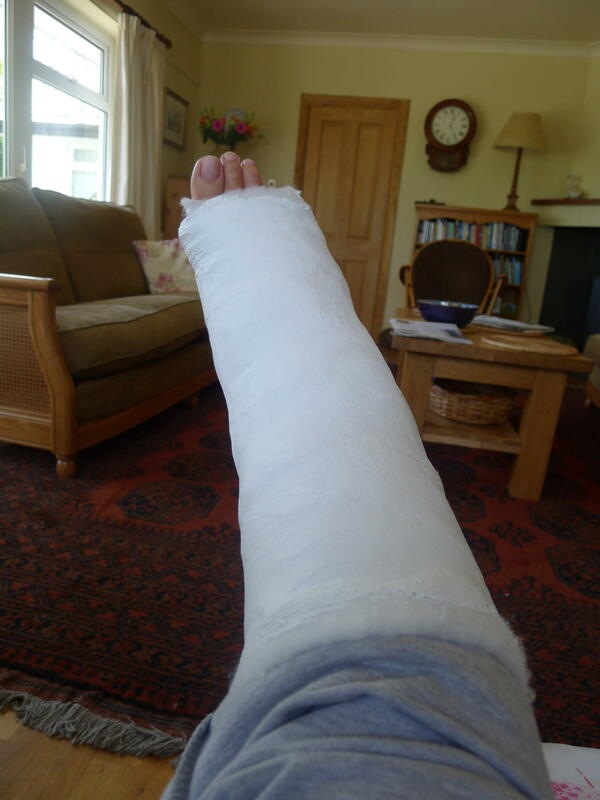 I now have a plate and 11 screws in my ankle, I’m thinking of entering it in the Guinness Book of Records. The weather is still very dodgy with the temperature struggling most days to get into double figures. If the sun does shine, a cold cold north wind drives us back inside. Oh for those lazy days sitting in the sun in Spain drinking wine!!! Well I’ve had a really exciting week!! 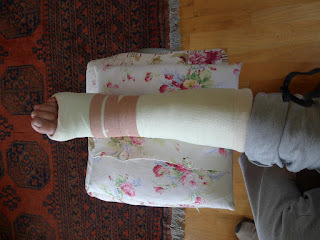 On Wednesday I got a new plaster cast, slightly less cumbersome than the previous one. It’s amazing what constitutes excitement when you are house bound. Also I had to rescue a spider on one leg (me, not the spider) from the bath which was quite a balancing act as he didn’t want to be rescued. I’ve been researching nutrition and supplement requirements for healing broken bones and the good new is that I need to eat a lot. As someone who loves to eat, this was music to my ears. So far I haven’t put on any weight – watch this space. Fortunately I can’t weigh myself, and I’m living in stretchy track pants, so I may be kidding myself. I think I’m entitled to some self-delusion. 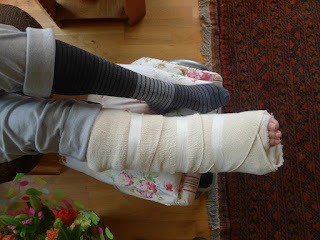 Next specialist appointment is Wednesday next week, so I will get another new cast then – that’ll be number 5!!! Hold tight for the next exciting instalment.